The Old Man, down an alley off Aberdeen Street just up from PMQ, is helmed by a trifecta of exemplary hospitality: Agung Prabowo, former bar manager of the Mandarin Oriental and the much lauded Lobster Bar; James Tamang, former bar manager of Vibes, the Mira’s excellent hotel bar; and Roman Ghale, ex-senior bar and restaurant operations manager at The Upper House. A stronger foundation for a bar in Hong Kong is hard to imagine. Adding some elan to that solid base is the establishment’s interweaving of Ernest Hemingway references throughout. 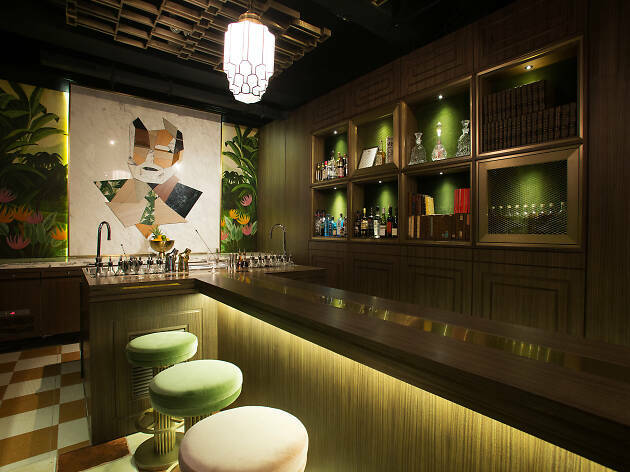 It’s tastefully done and although The Old Man is hardly the first bar in the world inspired by the American novelist, it’s a first for Hong Kong. It’s appropriate too. Hemingway was a man serious about his cocktails, much like each member of the team here. 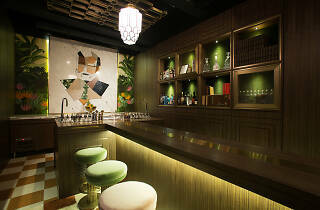 The 1,000sq ft venue is intimate yet lively, the bar counter shaped, unusually, like a capital I. Once we finish gawping at a beautiful portrait of Hemingway – made of excess materials leftover from building the venue – watching over one end of the bar, the overall design makes sense. Patrons sit communally or can perch at one end and admire Prabowo working his magic. Down the centre of the bar top runs a gold cooling strip to help keep drinks chilled. An impressive touch. 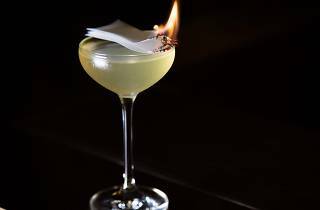 We cop a look at the cocktails on the menu, all of which are named after Hemingway novels and very well priced at $90 each, and start with The Snows of Kilimanjaro – marshmallow gin, lacto-fermented raspberry and citrus topped with grated gruyere. This dainty drink boasts a fluffy, cloud-like egg white foam atop an extremely well-balanced beverage. The sharp tang of the raspberries and citrus is smoothed out by the gruyere’s saltiness, making the cocktail seem like a liquid cheesecake, without being sickly. It’s perfect. We order an old fashioned to see how the classics fare and the result is one of the best in the city. 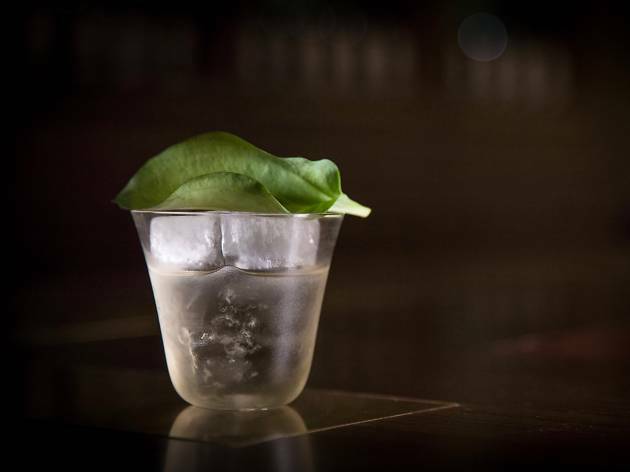 Two well-executed, gold star drinks down and we’re onto The Sun Also Rises – coconut oil fat-washed applejack, curry leaf-infused gin, sweet vermouth, sous-vide pandan leaves and kaffir lime. It’s so good it surpasses the gold standard. The instant the drink passes our lips, we’re fuzzy with delight at the buttery notes and nuttiness. The pandan rounds out everything at the back and there’s a cheeky tickle from the curry leaf at the end. 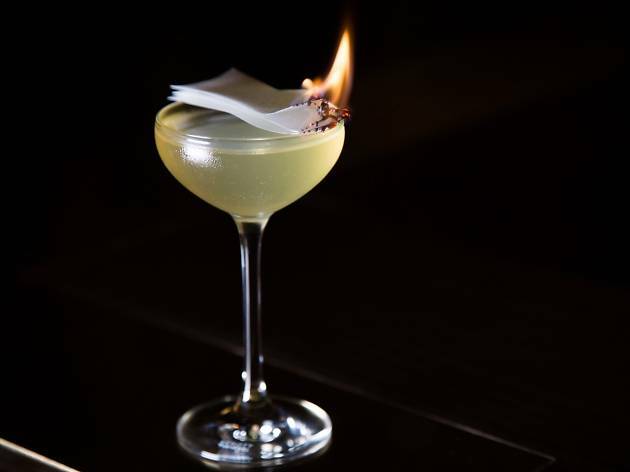 We can’t get enough of this incredible libation and order another round. The whole experience is faultless. From the minute we walk in the door, from the warm service to the luxurious yet unpretentious surrounds, the whole experience is delivered with effortless finesse. 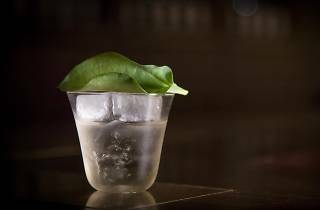 The drinks, suitable for neophytes and experienced drinkers alike, are of the calibre you’d expect to pay almost double for and in much stuffier surrounds. It’s been a long time since we’ve seen a drinking den as brilliantly thoughtful as The Old Man – hopefully it encourages many others to follow suit.